In the past, prior to the amendments to the Immigration Act, it was possible for an illegal foreigner to “legalise” or “regularise” him/herself from within South Africa by making payment of the requisite fine. This is no longer the case and we are constantly encountering foreigners who find themselves illegally in South Africa with little hope of rectifying their situation. In many cases, these illegal foreigners elect to depart South Africa and contest any ban issued to them from outside of the country. This involves the submission of an overstay appeal to the Department of Home Affairs (“DHA”). A number of foreigners, however, simply have too much invested in South Africa and are unwilling to depart the country for fear of incurring a ban that may or may not be overturned. Where an illegal foreigner wishes to “legalise” him/herself from within South Africa, he/she must meet certain criteria in order to do so. 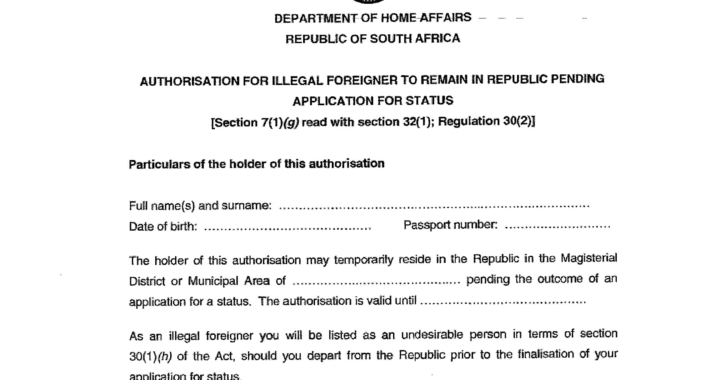 For the sake of clarity, “legalising” a foreigner entails applying to DHA for authorisation for the foreigner to remain in South Africa whilst submitting a visa application and awaiting the subsequent outcome. The “legalisation” does not provide the foreigner with the rights attributed to the holder of a specific visa until such visa has actually been issued to the foreigner. In order to qualify for “legalisation”, an illegal foreigner must satisfy DHA that: he/she was unable to submit a visa application timeously for reasons beyond his/her control and; that he/she is now in a position to do so. The latter requirement will be met by providing DHA with proof of a completed visa application containing all the requisite documents. The former requirement, however, is slightly more problematic. The question of what the phrase “for reasons beyond his/her control” refers to is not clearly answered in the Immigration Act, but it is generally accepted that these reasons include medical grounds and errors on the part of DHA. For example, where an Applicant has applied for a visa timeously, but DHA have subsequently lost the application and the foreigner’s visa has expired in the interim. All of this information will need to be provided to DHA in the form of written representations called an authorisation application. Such applications are commonly referred to as “good cause applications” by DHA officials. Authorisation applications are assessed on a case-by-case basis and there is a degree of discretion applied by DHA in considering whether additional factors should be taken into consideration. A prominent factor taken into consideration will be whether the foreigner in question is married to a South Africa citizen or has South African children. If such an application is successful, the foreigner will be provided with a Form 20 (also known as a letter of good cause) which authorises the foreigner to submit a visa application by a prescribed date. This authorisation lapses as soon as an outcome is received in the visa application. If the outcome is negative, the foreigner will need to depart South Africa immediately. If you require assistance with submitting an authorisation application or would like additional information, kindly contact our offices. Posted in blog, Live In SA and tagged authorisation application, good cause, illegal foreigner, legalise, overstay south africa. My grandmother was born in South Africa but attained Botswana citizenship through marriage. Because of ill-health she crossed over to South Africa to be with relatives. At the boarder, they refused to give her a 90 days because it was year end. They only allowed her 30 days. she wants to extend to 90 days and the only option they are giving her is through vfs and it is quite expensive! is there a way to extend her days without this much trouble? My fiance and I want to get married. He is however illegal right now as he has overstayed by I think 3 years or so. Will us getting married at Home Affairs get him deported, and how can we make his stay here legal? Please help! I would like to know is it possible for a foreigner who is in South Africa to get a Court order to be able to apply to stay in South African home affairs? I have a 2 year old son born in SA and want to legalise/regularise his stay in SA. He recently got a Zimbabwean passport as both parents we are from Zimbabwe. We are both on critical skills Visa and wanted to apply for him an accompanying dependent child Visa here in SA. I hear we are suppose to get legalisation from DHA but do not know how to go about it. We want to do applications here in SA, Are you able to assist? I’m married with 2 kids.my husband is south African I’m from Zimbabwe. They say I have to go home and apply for a spousal permit. I have been residing in sa since 2004 have been with hubby for almost 10 yes BT been married for 4. Is there no way I can do the whole application here in sa? Or if there’s any other way i can be legalised. Nw I jus have a visitor’s stamp on my passport . Greetings my name is Dee and I’m in a relationship with a guy who’s not from here and I’m an SA resident . He wants to apply for papers to stay here in SA since we are expecting our first born. Will he be allowed to do so without having pressure to marry me for the sake of our baby? HI my sister was brought to South Africa from what was then Northern Rhodesia, now Zamibia and has been living in the country for the last 50 years. She does hold a valid I.D. Book with Zambian in it, but that is all. Shew has lived, worked and paid taxes in this country all this time. Where does she stand with staying in the country? I had quota workers permit for Maths and Science educator that expired someone in January. I wish to know if there us a way I could legalize my stay in S.A. as there is a marriage and children involved. I ddnt know that I should have applied then not after expiration. Please assist me as my life is stagnant at the moment. Hello Admin! Please like how long does it take letter of good cause to be received on a spousal accompanying visa to study visa? Hi, im Daniel , overstay for 1 day at time because the trip was suspended in south Africa the give the ban for 1 year, and now my one is expired can I apply for a visit visa? Because I want to go and see my familly. Thank you for contacting us, we are very sorry to hear about your son. Please email this overview of your situation to immigration@lr-inc.co.za and include your contact details and a consultant will be in touch to discuss a solution for you. Thank you for contacting us. We can certainly determine possible solutions for legalising his status in South Africa. Please email immigration@lr-inc.co.za outlining the reasons for overstaying the visa and include a copy of the overstayed visa. A lawyer that specialises in these matters will get back to you. My husband needs to be legalised.He overstayed his visitors visa.We have been legally married for more than five years. I am a RSA citizen. He does not want to leave the country and apply for spousal visa from outside. Any advise? Hey Brian. You are currently overstaying in South Africa. When you leave South Africa, you will be declared undesirable and will be banned from returning to the country for a period of time. This ban can be overturned and this is something that we will be able to assist you with. Could you send us an email to immigration@lr-inc.co.uk with your enquiry? Come here (SA) on a Visit trip,but due to the problems I had I never returned home. I hv an overstay and I don’t know hw I can make things right.